Good afternoon and welcome to the almost world famous AoS Pet Thread. Does today's opening photo ring a bell? So grab yourself a beverage, relax and enjoy the world of animals. It was only a matter of time. Climate change is responsible for increase in animal bites. Stanford researchers warn that the number of animal bites is likely to rise amid climate change and developmental pressures. Rising temperatures are already exposing people in temperate climates to more mosquitoes and ticks, and developmental sprawl is reducing the amount of land available exclusively to animals. 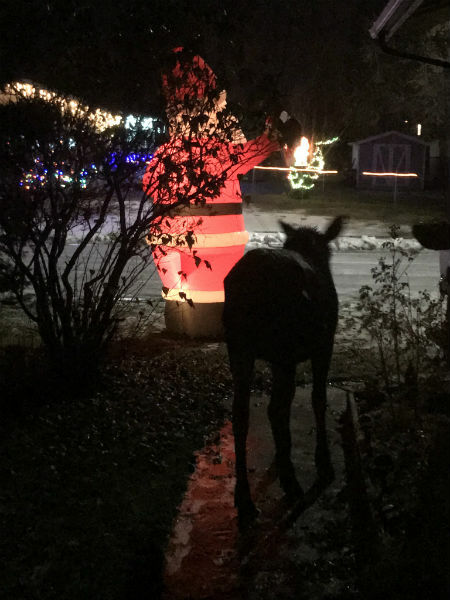 "As available habitat for these animals increasingly overlaps with human development and recreational activities," the researchers wrote in a BMJ news release, "it is expected encounters with animals may increase and could result in increased animal-related injuries." It's a rerun from an earlier ONT this week. In case you missed it, A pair of dogs made it through the Paradise, CA fire to be reunited with owner. Andrea Gaylord's house in Paradise, California, was completely destroyed by the devastating Camp Fire last month, but she feared she had lost something much more precious. As she raced to escape a fire that killed 85 people in Northern California, she called to her two dogs, brothers Madison and Miguel, but they were nowhere to be found and had to be left behind. "It was the worst feeling in the world,'' Gaylord said on TODAY Monday. "It's like you have to choose. The whole time I thought, 'What was going to happen to those dogs?' It was horrible." An Australian kitteh has used up one of its nine lives. -- An animal rescuer responded to a factory in Australia where he drilled a hole to free a cat that somehow became trapped between two walls. A couple of links from our friend Hank Curmudgeon. Another pet made it out alive of the Paradise, CA fire, Kitty-571. Here is little Velvet. She is 19 years old. (She is both the tiniest and the longest lived cat I've ever had.) She was abandoned by her mother as a wee kitten in late fall and has been in our hearts ever since. We put food out and were finally able to entice her to come inside from the deck when she was about 6 mos. old. 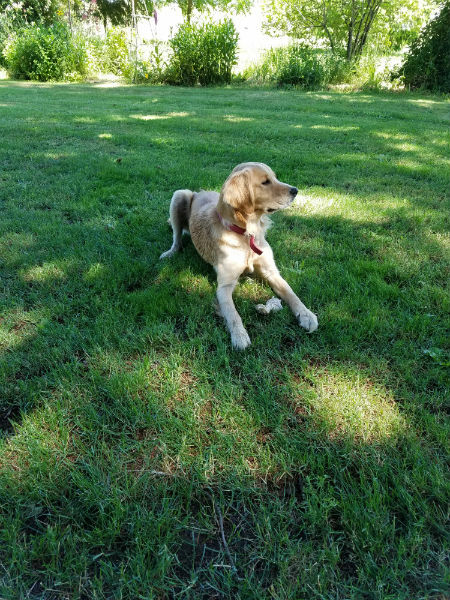 She endured a lot of cold icy nights and lost a hunk of her left ear to frostbite during that unusually brutal winter -- but that all just proves what a survivor she is. Unless one gets really lucky with the lighting it's hard to get good photos of black cats. 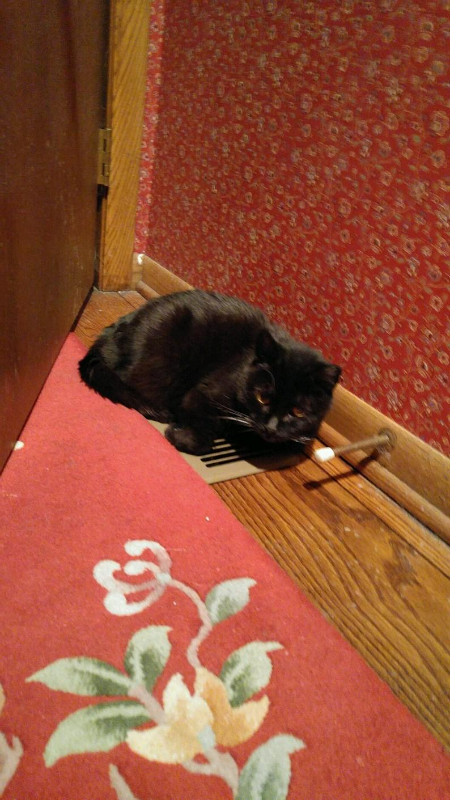 But in this recent picture she was caught performing one of her favorite wintertime activities these days: blocking warmth to the whole rest of the room while she snoozes on the heat register. Wow! 19 years is awesome. Velvet must have a pretty darn good life there at the corn and beans home. Thanks for sharing with us and your kind words about the Pet Thread. Maybe not a Pet Moron but definitely an Animal Moron unless it identifies as an amphibian. Thanks for sharing, that's a cool photo. Not an oaf or a lurker, but I am a lout. This is Saki, our kitten. What better name for a mischievous kitten than Japanese rice wine? Should we have named her "Boone's Farm"? Saki? 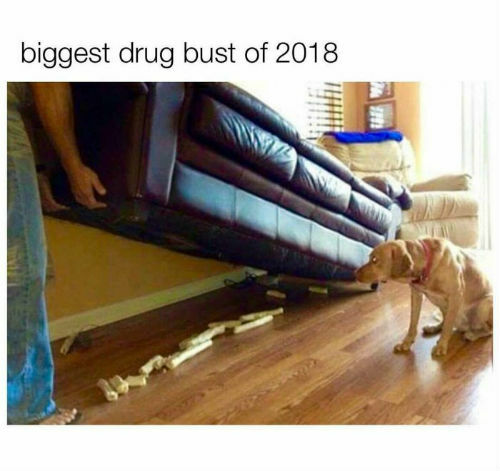 You could have name her 'Mad Dog'? Just kidding. 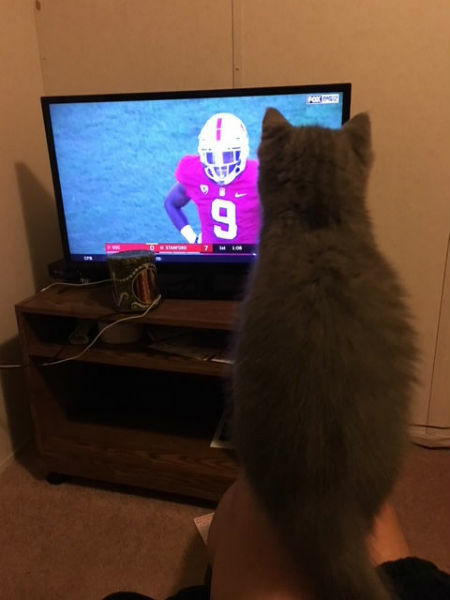 Nice looking kitteh and glad she watches football and not figure skating. We appreciate you submitting this story. Thanks for sharing these wonderful photos. 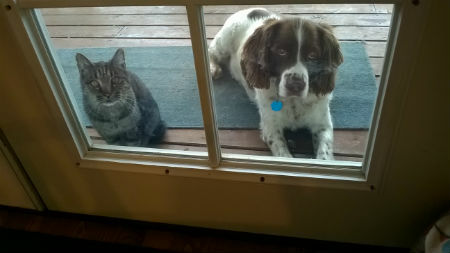 Love the photo of Biscuit and Max, "Let us in, Dammit!". Sorry to hear of Biscuit's passing. Thank you for stopping by this afternoon. And a BIG THANK YOU to those who submitted items for the Pet Thread. If you have something you wish to submit you can at petmorons at gmail dot com. Here's hoping you have a great week!! !